Our platform can process any EDI document. You do not have to worry about mapping or versions (4010 or 5010). We will enable your business process to consume this EDI in a very convenient way. The following picture shows some of the integration options. When you are working with EDI documents, it will be nice, if I can just focus on my business process instead of worrying about EDI specifications, loops, segments etc. Let me take a concrete example in healthcare. You organization is getting thousands of claims (837) you want to make sure that they have valid provider details, diagnosis codes and so on. Our platform will enable you to accomplish this without ever worrying about mapping or having to know anything about loops/segments. We have built some sample rules (which reside in boxes named BPM/Custom rule engine in the following picture) which will test the validity of NPI, route the claims based on the claim amount and/or provider address. These are just samples, you can do whatever you want with the incoming records(in this case of 837, they are claims). Also, for processing remittance advices, we have built some sample rules which will route the denied claims certain way, if the paid amount v/s charge amount falls below certain threshold, we route it differently. Goal of our X12 platform is to enable your organization to focus on business process and never worry anything about processing EDI documents. 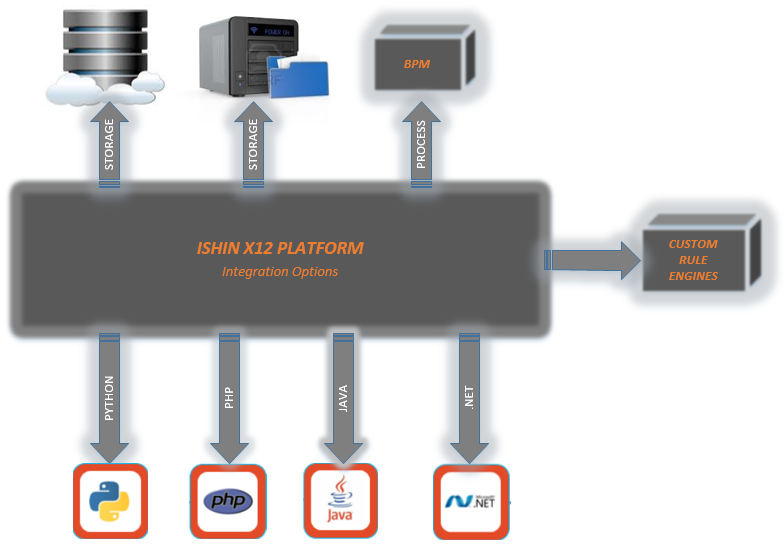 This platform can process any EDI specification. If you’re an enterprise responsible for processing large volume of EDI documents, our platform can handle this very easily. It is a very fault tolerant enterprise grade EDI processing platform.